We are excited to hear from our authors at all times, of course, but we are extra-excited to invite you to join us in sharing those experiences during our Annual “Show Us Your Love” social media event and image/video contest. All you have to do to be eligible for a win is count the ways you love Outskirts Press and your published book! The annual event, appropriately enough, takes place around Valentine’s Day, and we’re spreading the self-publishing love to you with a fabulous grand prize: a brand-new laptop computer. Please note, previous Show Us Your Love contest winners are not eligible to enter the contest within three years with the same book. The deadline to enter “Show Us Your Love” is Friday, February 15th. Record a brief video between 1 and 3 minutes long that demonstrates your deep and abiding love for your book, your publishing experience and Outskirts Press. The more creative, the better. Or alternatively, take a fantastic photo commemorating your love for your Outskirts Press publication. Creativity counts! Email your video file in an .mp4 or .mov format or your image in a .jpg or .png format to love@outskirtspress.com. The contest is open through February 15th. The three finalists who receive the most “likes” on Facebook for their entries will be selected for a public vote on the Outskirts Press blog from February 18th — February 23rd to determine the winner. Be sure you follow us on Facebook, Twitter and elsewhere so you can “like” your favorite videos or images and visit our blog to vote! The winner of the laptop computer will be announced via the blog on February 28. Submit your video or photo(s) as early as you can! The sooner your submission goes live, the more exposure you’ll receive and the more “likes” you can collect. Share the link to your submission once we post it to our Facebook page with all of your friends, family members, fans, and social media followers! (And of course, don’t forget to “like” your own submission on our social media accounts.) Contests such as this one serve as valuable—and free! —promotion for your book, so we hope you have a chance to sit down and whip up a great video or photograph(s) in the days to come! And that’s all the information you need to get started. We’ll be standing by to receive and share your submissions, as well as to answer any questions you might have. Swing on by our Facebook page at www.facebook.com/OutskirtsPress or our YouTube channel at www.youtube.com/OutskirtsPress to get a glimpse of some spectacular self-publishing love! Notable in every way. 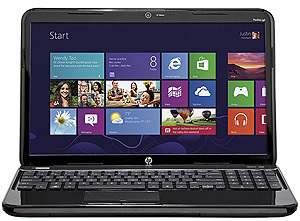 From its souped-up performance to its spacious display, the affordable HP Notebook 15 is set to be your go-to laptop. It combines a 7th Gen Intel Core i3 processor with 8GB of memory and a huge 1TB hard drive for excellent multitasking and multimedia capabilities. The Notebook 15 delivers great portability, too, with a weight that’s just 4.6 pounds and slim profile under an inch thin. With 8GB of memory, the Notebook 15 handles multitasking with ease while a 1TB hard drive has the space you need for storing volumes of files. A roomy 15.6-inch HD touchscreen provides a large canvas for work and play, and is excellent for kicking back with a movie. The 7th Gen Intel Core i3 delivers the most responsive performance to date with features like built-in security and 4K resolution support. DTS Studio Sound delivers deep, rich bass and crystal-clear highs, creating a pitch-perfect listening experience for music, videos, and games. A total of three USB ports (1 USB 3.0, 2 USB 2.0) are perfect for connecting and charging peripherals, while HDMI delivers big-screen sharing and entertainment. Vote now for the winner of the free laptop! In celebration of Valentine’s Day, Outskirts Press has been “sharing the love” and inviting its family of successfully published authors to do the same. This has come in the form of a $300 publishing promotion as well as a video promotion for the chance to win a free laptop. The video submissions have been collected, the best of them have been posted on our Facebook Page, and the “likes” have been tabulated. Now it’s time for you to vote for the winner of the free laptop! From among all the submissions we received, the top videos are presented below. Simply vote for your favorite in the polling box below the last video. The polls will be open until end-of-business on Thursday, February 28th. The winner will be announced on Friday, March 1st. Are you ready to publish your book? We are celebrating our writers and Facebook fans with our 25 Days of Christmas contest. The twelve days of Christmas expand this year to twenty-five in Outskirts Press’ 25 Days of Christmas contest that awards a Kindle, a Nook or an iPad2 in a drawing from the publisher’s Facebook fans who “Like” them from December 1st to the 25th. The more fans that “Like” Outskirts Press’ Facebook page at http://facebook.com/outskirtspress, the better the self-publisher’s giveaway will be. If there are 5,000 fans or less by Christmas day, Outskirts Press will have one random drawing from among all its fans to see who wins a free Amazon Kindle. If there are between 5,001 and 10,000 fans, there will be two random drawings; one for a free Amazon Kindle and one for a free Barnes & Noble Nook. If over 10,000 fans have “Liked” Outskirts Press, there will be three random drawings: one for a free Amazon Kindle; one for a free Barnes & Noble Nook; and one for a free iPad2. Any of the three e-readers that are available to be drawn on Christmas Day will make a perfect gift for a lover of the written word. The new Amazon Kindle is a lighter, smaller and faster version of its renowned earlier models. It weighs only six ounces, and while it has the same six inch screen, its body is eighteen percent smaller and fits easily into a pocket. It has a built in Wi-Fi®, has a high contrast E Ink® display that allows reading for extended periods without eyestrain, and its battery holds a charge for up to one month. The new Barnes & Noble Nook allows readers to touch, open a book, make the type bigger, look up words, organize one’s library, lend a book or shop for new titles. It has a breakthrough E Ink® display with a Best-Text™ function that reads just like a paper, even in the bright sun. More than two and a half million books are available instantly with the built in Wi-Fi® and, as with the Amazon Kindle, one can borrow books from one’s public library, as well. The Apple iPad2 is the crème de la crème of Outskirts Press 25 Days of Christmas e-reader gifts this year. It is only a third of an inch deep, weighs as little as one and a third pounds and allows users to surf the web, check e-mail, watch movies and take pictures. There are, in fact, two cameras on the device: one on the front that shows the user’s face as he or she talks via the device, another on the back that can be used to pass on a look at one’s surroundings as one talks. And, yes, the iPad2 can also be used to download and read books, periodicals and other texts — just like the Kindle and the Nook. Authors are being encouraged to click the “Like” button themselves for the Outskirts Press Facebook page and then to tell all their writer friends to do the same in order to increase their chances of winning. The drawing(s) will take place and the winner(s) will be notified on Christmas Day, December 25th. Why Enter the Readers Favorite Award Contest? Book Awards grab the attention of book stores, publishers, libraries, and readers, which can translate into increased sales. You can refer to your book as an “Award-Winning Book” and yourself as an “Award-Winning Author” on your book cover, website, and all other marketing materials. You can add your Award Sticker to existing copies of your book, or incorporate a digital image of it into new or reprinted versions. Already published and ready to submit your book? Click the button below to enter now. Not published yet and ready to publish your own award-winning book? Click below for free publishing guides to help you get started. The Next Generation Indie Book Awards submission service for self-publishing authors is open for any English-language book with a copyright date of 2010. Hurry! The deadline for order is February 18, 2011. Remember, your book must have a 2010 copyright date and be written in English to be eligible. A listing in the 2011 Next Generation Indie Book Awards Catalog which will be distributed to book buyers, media, and others! Exposure for a full year as a Winner or Finalist at www.IndieBookAwards.com. View a list of 2010 Winners and Finalists. The opportunity to display Finalist or Winner gold award stickers on your book. An invitation to attend the gala awards ceremony at the world famous Plaza Hotel in New York City. Other benefits of an award-winning book (such as potential increased revenue). PLUS, the top 60 books will be reviewed by New York literary agent Marilyn Allen of Allen O’Shea Literary Agency or one of Ms. Allen’s co-agents for possible representation in areas such as distribution, foreign rights, film rights, and other rights (unless an entrant prefers not to have the book forwarded to an agent). Ms. Allen has over 25 years of sales and marketing experience, including serving as Senior Vice President, Associate Publisher, and Director of Marketing for Harper Collins and directing sales and marketing teams for Simon & Schuster, Penguin Books and Avon Books. Ms. Allen has had the pleasure of working with many best-selling authors including Stephen King, Ken Follett, Barbara Kingsolver, John Gray, Mary Higgins Clark, and many more. All Finalists and Winners for the 2011 Indie Book Awards will be selected and notified by the end of May. Ready to publish your own award-winning book? Two Outskirts Press Facebook fans have become the happy holiday winners of an Amazon Kindle e-book reader courtesy of a free giveaway by Outskirts Press to celebrate both writers and readers during this 2010 holiday season. December 28, 2010 – Outskirts Press, the fastest growing self-publishing and book marketing company, announced today that their Facebook fans Shaun Scalerandi and Josh Sklar are the two winners of Amazon Kindles this holiday season. Outskirts Press has been sponsoring the contest this December as a way to celebrate both readers and writers through their Facebook page at www.facebook.com/outskirtspress. Shaun Scalerandi and Josh Sklar will find themselves in good and extensive company with their new Kindles. The Amazon Kindle is the number one bestselling, most wished for and most gifted product on Amazon’s website. The portable, wireless reader allows users to read their favorite books anywhere, anytime, and they can download their favorite magazines, newspapers and blogs onto it, as well. An improved Kindle display now makes reading all that much easier and a new battery design can provide up to a month’s worth of reading pleasure. Outskirts Press is also giving away a free iPad to one author who begins publishing this month. Details are on the Outskirts Press website at www.outskirtspress.com . About Outskirts Press, Inc: Outskirts Press offers high-quality, full-service self-publishing and book marketing services for writers and professionals who are seeking a cost-effective, fast, and flexible way to publish and distribute their books worldwide while retaining 100% of their rights, 100% of their profits, and 100% of the creative control. www.outskirtspress.com. Amazon Kindle Giveaway Winners Announced! Not a Fan of Outskirts Press on Facebook yet? Simply click the “Like” button on the top of our Facebook page (www.facebook.com/outskirtspress).